Our cushions were specifically designed with your comfort in mind. The Kinesis Yoga Knee Cushion was designed by an avid yogi recovering from two devastating knee injuries and rigorously tested to ensure a pain-free practice. Do you have pain when you do certain poses? More often than not, the yoga mats are not thick enough to provide enough stability and comfort, especially for certain yoga poses that places pressure on your joints such as your knees, wrists, elbows and hips. Poses such as Child's Pose and Table Top place most of your body weight to your knees. For those with previous knee injuries and knee pain, it causes a tremendous amount of distress or you might avoid it altogether! With the Kinesis Yoga Knee Cushion, you'll be able to do those poses you've constantly been avoiding without the pain! We've implemented a Velcro fastening system that will enable you to quickly secure the Kinesis Yoga Knee Cushion around your mat for easy travel! No need to roll and tie which can be cumbersome at times. Now, all you need to do is wrap the Kinesis Yoga Knee Cushion around your rolled up mat and go. For those traveling or looking to pack light, the Kinesis Yoga Knee Cushion can even be use as a compact yoga mat. Perfect if you're going on vacation and looking to continue your practice without skipping a beat. It is light and portable, yet big enough to provide the comfort you need to practice anywhere. 24" wide x 12.2" long x 1" thick. Our cushions are made from eco-friendly and high density NBR non-slip material. ALLEVIATE THE PAIN: Mitigate any knee pain, elbow pain, and wrist pain to enhance your yoga practice. The Kinesis Yoga Knee Cushion is the perfect solution to your joint pain so you can perform every pose pain-free and in comfort. 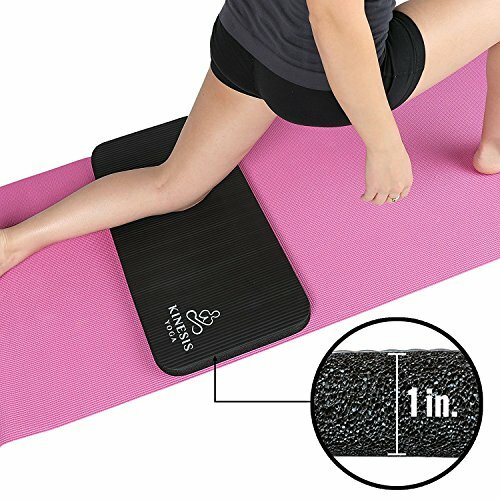 EXTRA THICK YOGA MAT: Turn your regular yoga mat into a thick yoga mat. Our knee pads are the only ones on the market that offer an entire inch of soft, cushy padding. Plus, our cushions are 24" wide - a perfect fit for any standard sized yoga mat, offering plenty of room! UNIQUE VELCRO FASTENING SYSTEM: No need to roll here! Simply, fold it in half and secure it around your mat with our Velcro system fastening system. We've upgraded the strength of our glue to the highest grade to make your mats last even longer! WE CARE ABOUT THE ENVIRONMENT: Our cushions are made from eco-friendly NBR material. No PVC, toxic or harmful chemicals. Our mats are odor-less, non-slip, and durable. 100% SATISFACTION GUARANTEE: Try our mats 100% risk-free! If you have any issues with your mats, we will make sure we resolve the issue as soon as possible. You have nothing to worry about, we have your back! If you have any questions about this product by Kinesis Yoga, contact us by completing and submitting the form below. If you are looking for a specif part number, please include it with your message.